Virginia Johnson with her DTH dancers. Photo by Andrea Mohin for the Times. This summer, I spoke with Virginia Johnson, the longtime star of Dance Theatre of Harlem, who is now the troupe’s Artistic Director. You can see the interview, on DanceTabs, here. 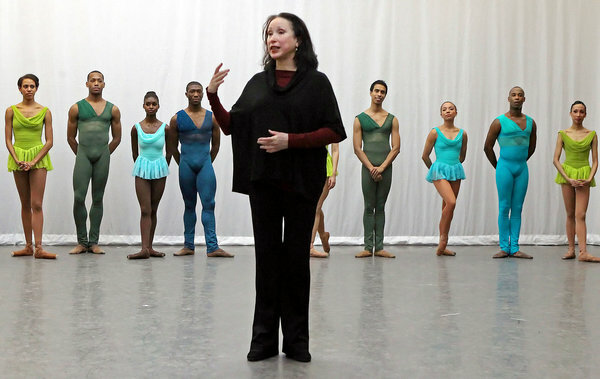 The question of diversity in ballet is finally coming to people’s attention. Benjamin Millepied mentioned it in an interview related to his upcoming directorship of the Paris Opera Ballet, in comments that pissed off the French media. (He said, “I can’t run a ballet company now, today, and not have it be a company where people in the house can relate to, and recognize themselves in some ways.” Shocking.) ABT has just announced a new initiative whose mission is to reach out to minority communities through Boys and Girls Clubs across the us. (ABT’s Misty Copeland will be the ambassador for the program, which is called Project Plié.) Meanwhile, DTH will be there.